The workaround is not my own creation. I don’t want to take the credit for it. It wouldn’t be fair! It is a library created by Karl Wan that he made available on github at https://github.com/lppkarl/YahooFinanceApi. I will provide here some code using the wrapper library in both VB and C#. The solution was created using Visual Studio 2017 but should also work in previous versions as long you can target the .Net Framework 4.6.1 or above (a requirement from the wrapper library). 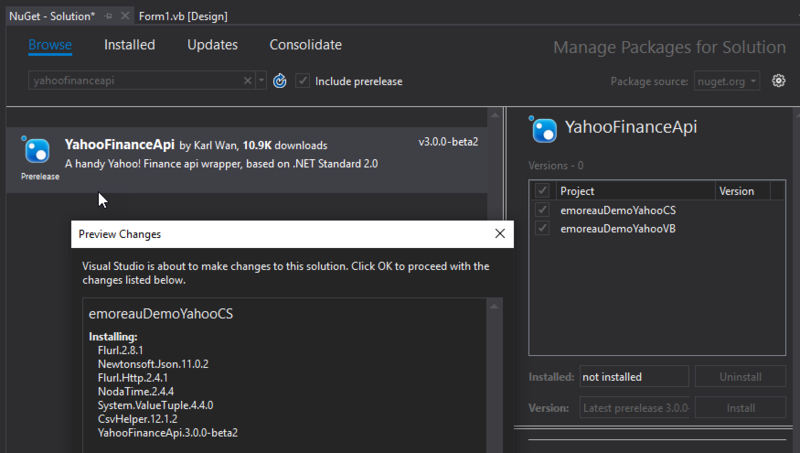 The very first thing you will need to do will be to add a reference to the NuGet package which will also bring some other dependencies as shown in figure 1. At the time of writing this article, there is a v3 beta2 of the library available. I don’t recommend using it as I don’t have good experiences with it. Better use the last stable version which is (still at the time of writing) 2.1.2. 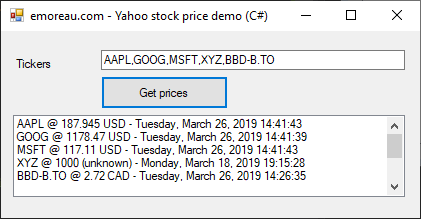 When you hit the “Get prices” button, an asynchronous query is sent to Yahoo requesting specific fields (more on this later). This is the code calling the library. Dim securities = Await Yahoo. Fields(Field.Symbol, Field.RegularMarketPrice, Field.RegularMarketTime, Field.Currency, Field.LongName). The first thing you notice is that we are specifying the tickers for which we want to get prices. My demo is taking that information from the textbox in which you can set a single ticker as well as a comma separated list of tickers because we are using the Split function to convert the textbox values to an array of string as required by the Symbols method. The second thing you see is that we are specifying the fields we want to retrieve. If you click on the Field keyword and hit F12 (or right-click the Field keywork and select Go To Definition), you will find the list of the 65 available fields. Just like when you are querying a database, you are trying not to do a SELECT * to reduce the number of columns being returned. Here too you will try to be as specific as needed for the very same reasons. In my example, I am specifically requesting 4 fields. There are also other ways to specify the fields, but I prefer a lot this one. For example, you can pass an array of strings, but this method can lead to typos. 'for some reason, the currency is not always available! //for some reason, the currency is not always available! It is a simple for each loop looping through the values of the dictionary. Some fields are to be used with extreme caution. For example, Currency and LongName don’t always have a value, they can throw exceptions when you try to get their values, so you must deal with it. If you are trying to request an invalid ticker, Yahoo will just skip that ticker and it won’t include it in the returned values. The library does a lot more than what is demoed here. For example, it has features to retrieve historical prices, splits history and dividends history. I don’t blame the free data provider to change their mechanism every so often. It is part of the agreement that the data from Yahoo is not supposed to be used as your main data source of stock prices. And I only use their data to compare against my paid sources to see if they stand correct. I found errors in the past and now need to protect my … reports! Anyway, anything sites like Yahoo are doing to change their mechanisms, somebody will always find a workaround to it! Hopefully, that won’t happen too soon. One last thing, if you are curious about the data exchanged between your application and Yahoo (the URL sent to Yahoo and the JSON answer), you can always rely on tools like the free Fiddler Web Debugger.